Home products that work with smart thermostat Nest are quickly becoming a cottage industry, but new washers and dryers from Whirlpool just might be the largest appliances that connect to Nest—literally. The new Smart Top Load and front-load washers and dryers hit the market this spring with an EcoBoost option that uses information from your Nest to delay cycles while you’re away. EcoBoost sets a longer dry time at a lower temperature to save you money when you’re gone. 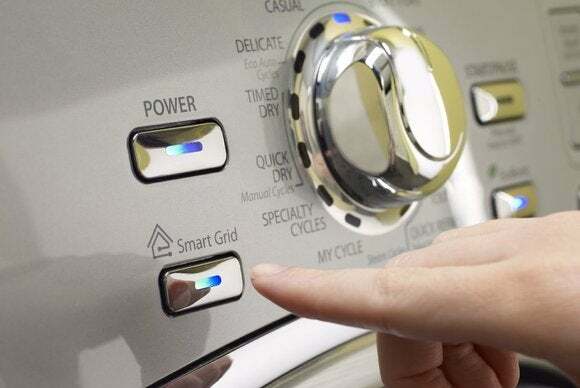 If you’re already signed up for Nest’s Rush Hour Rewards program, Whirlpool will delay your washer and dryer cycles until peak demand subsides. The new Nest integration is opt-in with Whirlpool’s latest machines, so it will only work if you want it to. Whirlpool's new washer and dryer use your Nest to figure out when you're not home. The more than 100-year-old home appliance company plans to show off its new smart top-load and front-load washers and dryers at this year’s CES. Whirlpool is the first major appliance company to link up with the thermostat makers after Nest opened up a program for developers last summer. While it’s a nice perk, you don’t really need Nest to tell your washer and dryer if you’re away—you can do it yourself with the Whirlpool app that already acts as a remote for the company’s latest appliances. The company’s new appliances are also integrated with another high-profile partner: Habitat for Humanity. You can use the Whirlpool app to donate money to the nonprofit with every wash and dry, so you can clean your conscience and your clothes simultaneously with the first philanthropic appliances in the U.S.
Whirlpool will also be showing off its new vision at CES for your future connected home, including interactive backsplashes and smart cooktops that let you tap into your social networks while you chop, dice, and stir. Check back later this week for TechHive’s tour of Whirlpool’s interactive kitchen.